Green beans are an amazing vegetable. There are so many different things you can do with them and they'll taste great every time. From hot dishes to cold salads, the green bean is the most versatile of all beans. 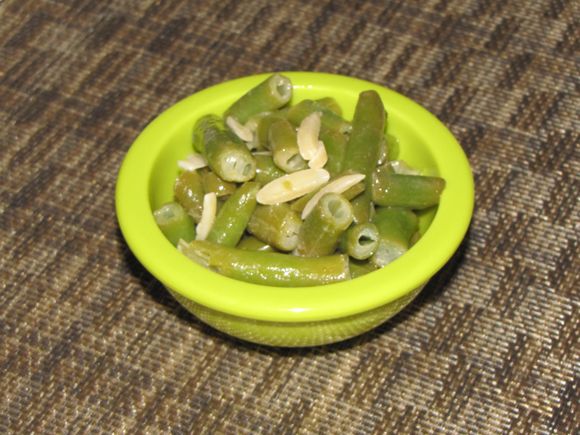 One of the ways I like to cook them is to make Green Beans Almondine. It is, in my opinion, the absolutely most perfect side dish of all time. When you add butter, almonds and lemon juice to green beans, they are transformed into pure bliss in a pan. My son loves this side dish just as much as I do. He pretty much loves any kind of green bean, though, but these are his favorite because of the almonds. It's a fun, little, crunchy treat when they're mixed in with the beans and if you have a picky eater, it's a great way to get them to eat their veggies! 2. Melt butter in saucepan and add almonds. 3. Cook over medium heat until they smell nutty and are almost brown. 4. Turn heat off and add salt and lemon juice to pan. 5. Mix in green beans and serve*. *As the beans sit, they may turn a slight brown color. Don't be worried, this is just the acid from the lemon juice reacting to the hot beans. They are perfectly fine to eat this way.